The Parkville War commemorates local residents who died in service or were killed in action during World War One. The monumental mason was Peter Jaguers of Jageurs & Son who had to include the name of his son, John among the dead. The monument erected by the people of Parkville to their soldiers who fell in the war occupies a commanding position at the intersection of Royal-parade, as Sydney-road is now called, and the avenue adjoining the Parkville Presbyterian Church, the authorities of which gave part of the ground, the parks and gardens committee of the City Council giving the other, for the erection of the monument. 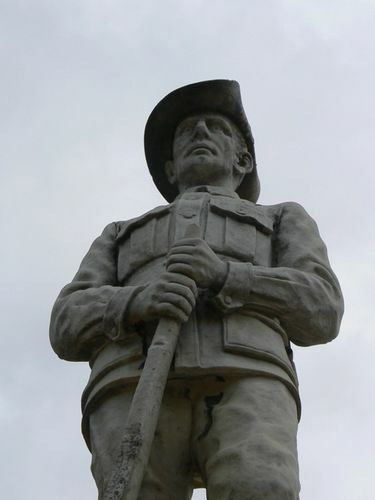 The memorial consists of a Lethbridge bluestone plinth on which stands a Harcourt granite pedestal, and surmounting this is the figure of an Australian soldier carved in white Carrara marble. The marble was brought from Italy. The workmanship is all Australian. Mr. Jacobs (sic) was the sculptor. The Lord Mayor (Cr. Brunton) performed the unveiling ceremony yesterday. The generations yet to be would be reminded by the memorial, he said, of the unselfish sacrifice made by those who went to defend the Empire and fight for the liberty and freedom we enjoyed. The dedication ceremony was performed by the Rev. F. Wade. Brigadier General H.E. Elliot delivered an encomium on the A.I.F. The Age (Melbourne) 5 October 1925.